Dr. Devin Brown is a Lilly Scholar and Professor of English at Asbury University where, in addition to other literature classes, he teaches a course on Lewis and Tolkien. He holds a Ph.D. from the University of South Carolina and a Master’s degree in creative writing from the University of Florida. He has done further study at Oxford University and University College Dublin. He is an award-winning author and a frequent speaker at conferences and on college campuses. Dr. Brown was born and grew up on Chicago’s south side. He and his wife, Dr. Sharon Brown, live in Lexington, Kentucky with their 15-pound cat, Mr. Fluff. In addition, he was a contributor to The C. S. Lewis Bible (HarperOne 2010) and The Screwtape Letters: The Annotated Edition (HarperOne 2013). In 2008 Dr. Brown served as Scholar-in-Residence for the Summer Seminar held at The Kilns, the Oxford home of C. S. Lewis. 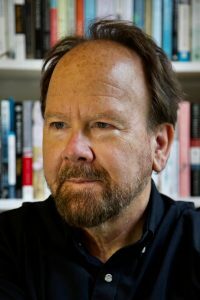 He has published numerous essays and scholarly articles on C. S. Lewis and J. R. R. Tolkien and has written chapters or forwards for nine books, including a major chapter on The Screwtape Letters for the 4-volume series C. S. Lewis: Life, Works, and Legacy released by Praeger Publishers in 2007. Dr. Brown has been a featured author for the Kentucky Reading Project, the Kentucky Book Fair, the Delaware Book Fair, the Ohio River Festival of Books, the Bluegrass Festival of Books, the Clarksville Writers’ Conference, the Southern Kentucky Book Fest, and the Kentucky Writing Project. He has been an invited speaker at the Ichthus Music Festival. He has been a keynote or plenary speaker at Villanova University, Aquinas College, Wheaton College, Calvin College, John Brown University, Asbury Theological Seminary, Huntington University, Grace College, St. Catherine College, and Taylor University. In 2011 he was a headliner at The C. S. Lewis Festival in Petoskey, Michigan. He has been a Convocation Speaker at Milligan College and Lexington Theological Seminary. In 2010 he was invited to appear on the Narnia Summit Panel with Michael Apted, Micheal Flaherty, and Douglas Gresham in the Zanuck Theater at the 20th Century Fox Studios in Los Angeles. His novel for young people Not Exactly Normal was named a Children’s Book Council Notable Social Studies Book and has been listed on Bank Street College Best Children’s Books of the Year. He is frequently invited to appear as guest author at schools which have used Not Exactly Normal in their classrooms. He is listed in Contemporary Authors and in Book Letters. Dr. Brown has presented scholarly papers on Lewis and Tolkien at many venues including Oxford, London, the University of Wroclaw in Poland, the University of Kentucky, Belmont University, Wheaton College, the University of Louisville, and the University of Surrey in England. He has served as Visiting Writer-in-Residence at Transylvania University. Dr. Brown has been a judge for Christianity Today’s Book of the Year Award. He has served as a Consulting Editor for Irish Studies Review. He is a recipient of The Francis White Ewbank Award, Asbury’s highest honor for teaching. He has published original poetry in literary journals, among them Connecticut Review, Wind, The Chaffin Review, South Carolina Review, Cold Mountain Review, The Cumberland Poetry Review, and the Journal of Kentucky Studies. In winter of 2007, Dr. Brown was part of the Asbury University team that produced the Educational Resources DVD to accompany the film Amazing Grace, a Walden Media production which told the story of the campaign led by William Wilberforce to abolish the slave trade in England. In 2013 he was again part of an Asbury University documentary team–this time helping to produce the video C. S. Lewis: Why He Matters Today. He wrote the script for The Hound of Heaven: The Story of Francis Thompson released by Oxvision Media in 2014. In 2015 he was the writer and researcher for the 8-part video Discussing Mere Christianity (Zondervan) which was filmed on location in Oxford and features Eric Metaxas as host.